Picture: A previous gathering of Bangladesh churches - meeting for strategy and encouragement. From an email sent by James Karmakar (GRN Bangladesh) to Christine Platt (GRN Australia). As you know that in last year some of the Church's Pastors and Leaders had been given threatening against the propagating of the Christianity in Bangladesh and some pastors were attacked to be killed. That was the fear among the Christian society whether the Churches would be continuing to witnessing Christ. Government security people called the missionaries, pastors, Church leaders to discuss about this matters that how they could help us and protect the Christian society from this kind of miscreant people. They had advised that not to do the missionary work at outside the Church during this time as the situation does not allow. Therefore, the GRN Team was under pressure whether we should go for distribution work or not in the beginning of the year-2016 which was the time for distribution work at any places where the Churches also arrange their big gathering or revival meeting during this time. By the grace of God the situation has become normal now, but still the fear has been going on throughout the country among the Christian society as some of the majority group of people in the society has been doing silently and giving threatening here and there against the Christianity. However, the situation is not getting worse now as it was last year. Because of that most of the Churches or denominations have taken the decision to have the Church gathering or revival meeting this year which had normally been done every year at the beginning of the year. During this time the weather would be suitable for this kind of revival program that people could attend from different Churches to stay for couple of days. Therefore, we got the date of the different Church's or Denomination's program in different times in different Districts from February to April, 2017. We the GRN Team would like to attend those meetings for distribution work. Thanks for your prayer support that the Lord may answer our prayer request. 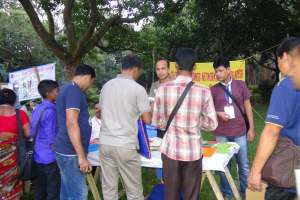 Please pray for the GRN Bangladesh team and the churches in that country, and consider if you can make a contribution. To find out more about Bangladesh Distribution Work please contact Christine Platt in the Australian office. 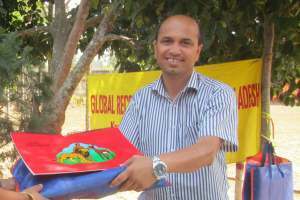 Or you can give here designating your gift to "Bangladesh Distribution Work".